Dimensions 13 inches H. x 3.75 inches W.
Damage/Repair general wear, does not stand; see pictures for details. 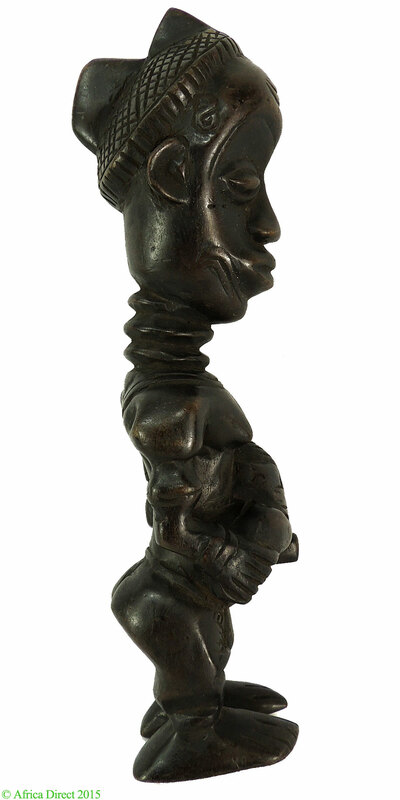 This well carved figure of a standing mother holding a child comes from the Luluwa.The Luluwa style is recognized here by the abundance use of body markings. 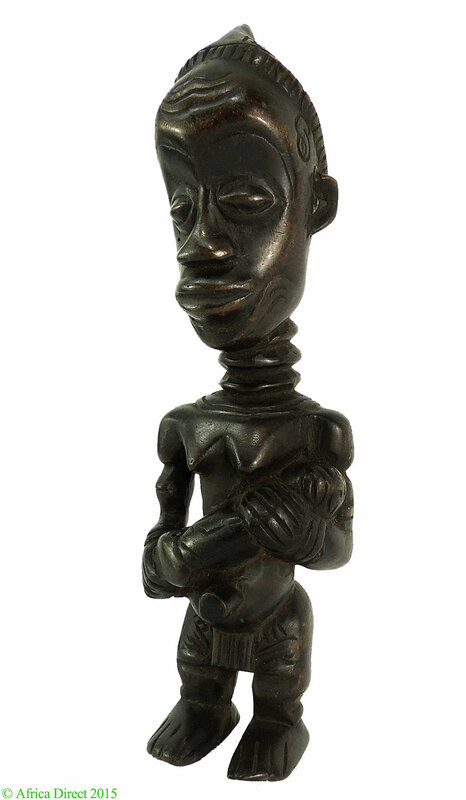 This so-called maternity figure represents a lineage ancestor supporting her descent. 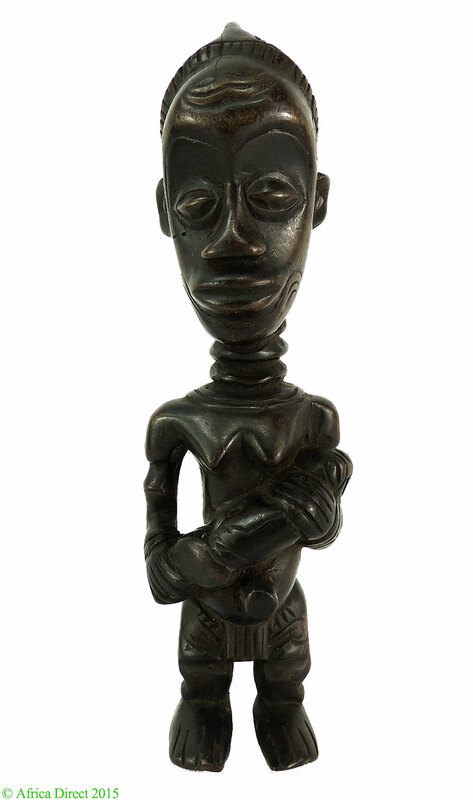 Such figures were used in the fertility ritual, called Bwanga bwa Tshibola. Scarifications on the head body and the arms are marks of the Luluwa ethnic group that are said to have some heroic functions. The Lulua are a relatively medium sized ethnic group of approximately 300,000 living in villages in the area of the Kasai River. Having migrated into the region they have come in contact with a number of larger and better-known people such as the Luba, Pende, and Chokwe absorbing some cultural and artistic traits from them. 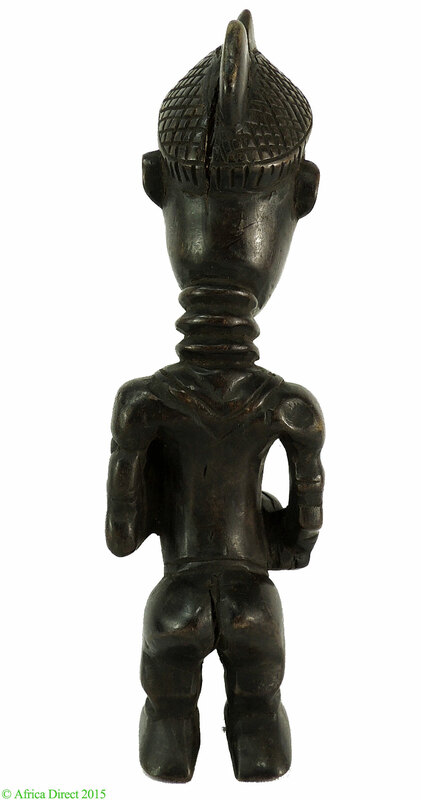 Usually figure like this portrays an elite of Lulua society, a chief or warrior. They are seen holding a sword in the right hand and a magical container in the left hand to hold the spirits of the ancestors. Like here, the skirt and hairstyle are markers of his status and the exaggerated umbilicus a common trait among Lulua. Sculptures of the Lulua people are well known for the elaborate scarification patterns worked onto the surface of the figures. These patterns are identified in some instances with symbolic meaning but must equally be viewed as aesthetic embellishment important to the Lulua. Though banned in the late 1880 s scarification has reemerged albeit in a much reduced fashion to again identify the Luluwa.